While Allen’s dad has some experience woodworking, this would be Allen’s first project. We eagerly designed a table for our new dining room, to seat as many people as possible within our space. Our final design was 8 feet by 4 feet. I think it is safe to say that both Allen and I *may* have underestimated the scale of this project! I can take no credit for the actual construction of the table, but I am happy to report that after 5 months, countless hours, and many lessons learned, the table is complete! Not only is the table complete, but it is fabulous! The inaugural dinner at our new table was also amazing! We hosted our Supper Club and each course was impressively delicious. 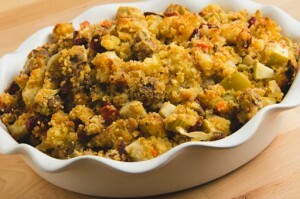 We prepared the main course, and I instantly fell in love with this cranberry, apple and cornbread stuffing. Both savory and sweet this stuffing would pair fantastically with poultry or pork. It is perfect for the holidays or as part of a warm and hearty winter meal! Cube cornbread and set aside. In a large pan, over medium high heat, brown the sausage. Remove the cooked sausage with a slotted spoon and place on a plate with a paper towel to drain some of the excess grease. Once the sausage is removed, add the butter to the remaining drippings in the pan. Once the butter is melted, add the onions, celery, carrots, herbs, salt and pepper. Cook until the vegetables are tender, about 10-15 minutes. Then add the chopped apples and cranberries and cook until the apples begin to soften slightly, about 5-10 minutes. In a large bowl (I had to use my roasting pan), combine the cubed bread crumbs, sausage, and vegetable/apple mixture. Slowly drizzle the chicken stock over the stuffing to moisten. Continue to stir and drizzle until the entire mixture is moist, but not soggy. Spoon the stuffing into a baking dish. Bake covered for 30 minutes; uncover and bake for an additional 20-30 minutes. Confession of a *wannabe* foodie… I had every intention of baking the cornbread to use in this stuffing. As I passed the bakery section of my local grocery store and caught 2 packages of pre-made cornbread staring at me longingly from the shelf, I decided the shortcut would probably be worth it and tossed them in the cart. Totally worth it.